Date formats vary with region and language so, it is always helpful if we can find a way to display the dates to the users, specific to their language and region. In this post we will be looking into date formatting using this API. To show the date as per user’s preferred locale, first we need to know what that preferred locale is. Currently the foolproof way to know that is to ask the user; let users select their preferred language and region settings in the webpage. But, if that is not an option you can interpret the Accept-Language request header or read the navigator.language(for Chrome and Firefox) or navigator.browserLanguage(for IE) values. Please know that not all of those options return the preferred language of the browser UI. To know if the browser supports Internationalization API or not, we can check for the presence of the global object Intl. Intl is a global object for using the Internationalization API. It has three properties which are constructors for three objects namely Collator, NumberFormat, and DateTimeFormat. The object we will be using is DateTimeFormat which will help us format date time as per different languages. locales – a string or an array of strings that represent the language tags, for example; “de” for German language, “en-GB” for English used in United Kingdom. If a language tag is not mentioned, the default locale will be that of runtime. The instance of the DateTimeFormat object has an property accessor (getter) called format which returns a function that formats a Date based on the locales and options found in the DateTimeFormat instance. The function takes a Date object or undefined as an optional argument and returns a string in the requested date format. Note: If the argument is either undefined or not provided then it returns the value of Date.now() in the requested date format. And now let us code a simple date formatting. See the Pen ZGbLdL by Preethi (@rpsthecoder) on CodePen. Let us change the language and see the output. See the Pen gpambJ by Preethi (@rpsthecoder) on CodePen. Now, it is time to look into options. See the Pen QbjpvK by Preethi (@rpsthecoder) on CodePen. Instead of using a formatter like shown in the above examples, you can also use Date.prototype.toLocaleString in the same way with the locales and options arguments, they are similar but it is recommended to use the DateTimeFormat object when dealing with too many dates in your application. // returns "Wed, 22 April 2015"
To check for the supported locales, we can use the method supportedLocalesOf of DateTimeFormat object. It returns an array of all supporting locales or an empty array if none of the locales is supported. For testing, let us add a dummy locale “blah” in the list of locales to be checked. 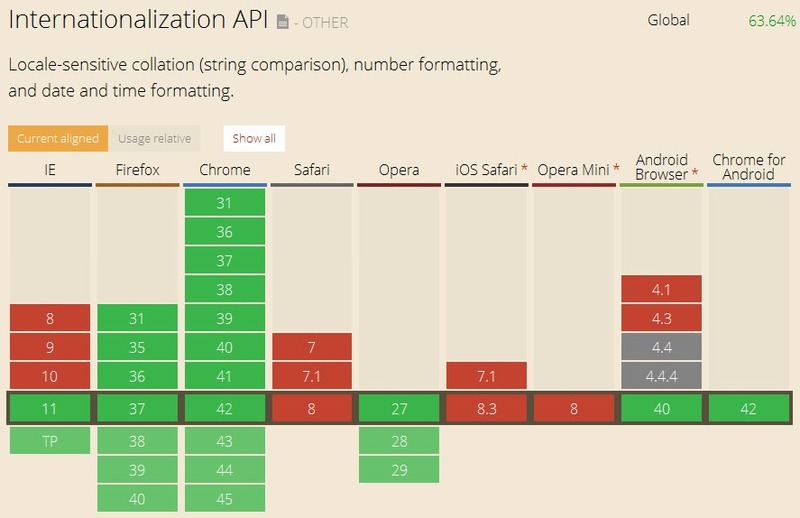 At of the end of April 2015, major browsers support the Internationalization API.